I don’t often bake when it’s just the two of us at home, so having friends to stay (like we did this weekend just been) is a great excuse! I usually bake a day in advance and Hubby has termed it ‘Decorative Baking’ because he is not allowed to touch it until our guests arrive! 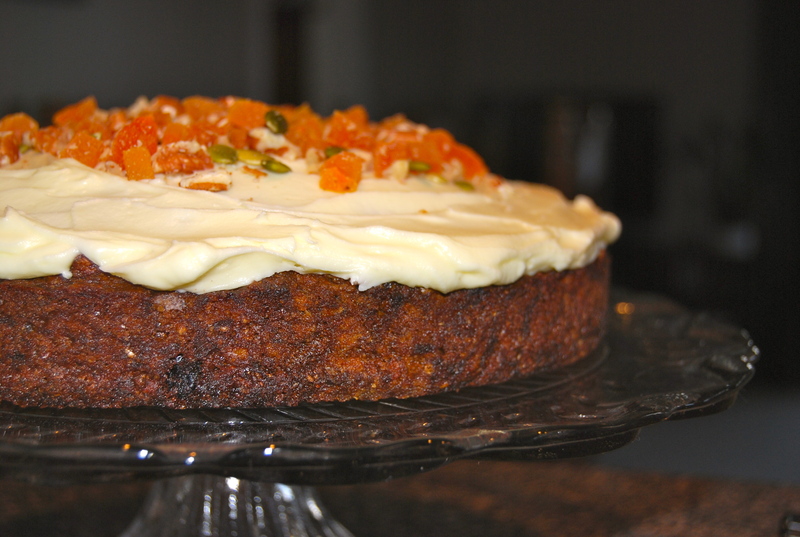 This time around I decided to bake something I know most people enjoy, Carrot Cake (you just can’t beat that cream cheese icing!). I hadn’t made one in such a long time so I Googled a recipe and the first result that came up was ‘Chelsea Sugar’s Best Ever Carrot Cake’. It was full of goodies including coconut, sultanas and walnuts and took just 10 minutes to put together. I was really pleased the result though I recommend undercooking it slightly from what the recipe suggests – I cooked mine for just 45mins instead of an hour and I think even 5 minutes less would have made it just that little bit more moist. ← When you damage your tablecloth… make cushions!